What is the ultimate form that the Aegean Sea has taken? In other words, what is the relief map of the territory supposing that there is no water? 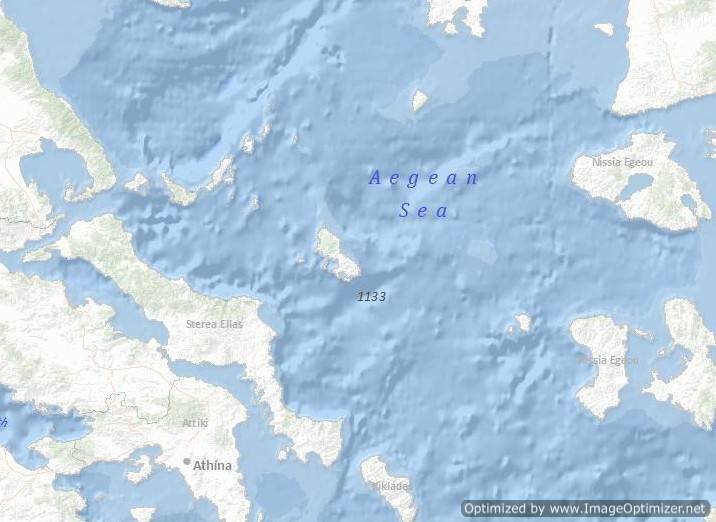 How the lands are connected around the Aegean Sea with its islands and bottom? The morphology of the area, the tectonic structure of the layers with different compositions. In the center, there are crystal form stones which are the continuation of the rocks in the eastern part of Greece mainland. The period that the Greek mountains were formed, these rocks were in the area that stretches to the North and Central Aegean in our days. They were rigid masses which were torn in their full extent. In the area of South Aegean the rocks are mainly sedimentary, therefore much more plastic. Also torned, but shattered to pieces. The tops of those pieces became islands. In the north, the coast does not present any special partitions. Only one part has a unique geographical characteristic . The peninsula of Chalkidiki, ending in three smaller peninsulas, Kassandras, Sithonias and Athos (Agio Oros). This coastline is continued below the sea surface as a shelf, meaning as underwater ramps in a relative small depth. Extends to a distance of 50 km and the depth varies from 100 to 200 meters. The islands of Samos and Samothrace are on this. South of the continental shelf a deep basin is formed, the Basin of the North Aegean that enters the two bays of Chalkidiki, Kassandras and Athos. In the south, in front of the three peninsulas of Chalkidiki, an oblong cavity opens having a southwest direction. The depth of Thermaicos bay in many places exceeds 1.000 meters. Between the island Psathoura, the north easternmost of the Northern Sporades and cape Drepano, the southern tip of the peninsula of Sithonia, 12 nautical miles from Psathoura and 19 from Drepano. The depth reaches 1550 meters which is the deepest point in the northern Aegean. The southern edge of this "groove" is closed by a reef back, a hill which is a continuation on the east and northeast of the peninsula of Magnesia. The peaks in sea level is the Northern Sporades - Skiathos , Skopelos , Alonisos and other smaller islands of the complex until the last one , the lava Psathoura - which are separated from each other by narrow and shallow channels, except for Skyros in the south. Something similar happens in the northeast side of the Aegean. In an underwater platform with 100 to 200 meters depth, further to the Gallipolis peninsula and the Asia Minor coast of Troad where the islands Imvros and Tenedos are located. South is Lesvos, which is separated from the coast of Asia Minor from the Lesvos strait with 9 km width and from Mouzelim strait with 13 km width. The depth of both seas straits is less than 80 meters. South of Lesvos, is Chios, separated from the opposite coast of Asia Minor by the channel of Chios or Cesme Bogazi, a narrow passage of 7 km width. Northern of Chios Inousses islands are located. The sea area between Lesvos and Chios has 600 meters depth and is connected with the deep basin of the Central Aegean starting from Skyros and South Evia, passing Tinos and reaching Icaria, Samos, and Chios. West of Psara a shaft opens with 1.042 meters depth and north of Ikaria another one with 1.262 meters depth. 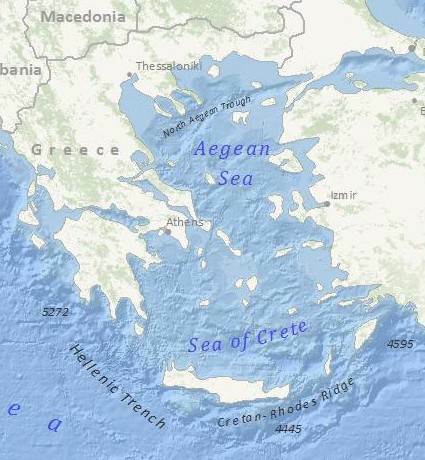 The basin of Central Aegean stops south by a submarine plateau which has a depth of 200 meters. The highest points of this plateau are the East and South Cyclades from Andros to Ios. Cyclades is the continuation of Evia the large long island near the eastern coast of Greece mainland. West of the plateau there is a moat with 300 meters depth, separating the eastern from the western Cyclades. Beginning at north of Kea, reaches Folegandros and Sikinos. 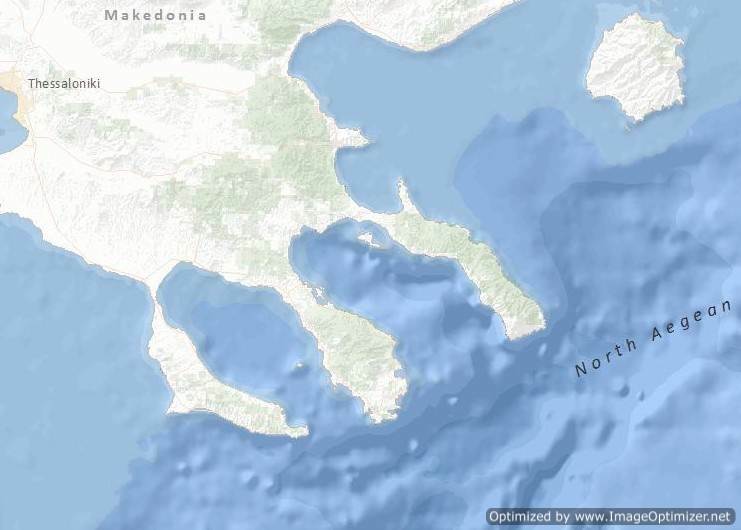 These Cyclades are the continuation of the south part of the peninsula of Attica which has precipitated. Deeper is the sea that separates the islands of South Cyclades, Milos and Santorini. It is considered that this is due to the intense volcanic activity that characterizes these islands since the ancient times. West of the Western Cyclades - from Kythnos, Serifos and Sifnos - stretches the Myrtoo Sea. To its bottom opens a pit of 933 meters depth reaching the island of Falkonera to the south. East of Cyclades submarine plateau, opens a "groove" with 1.000 meters depth. Then another submarine plateau is formed, from which the islands of Ikaria, Samos and Kos emerge. 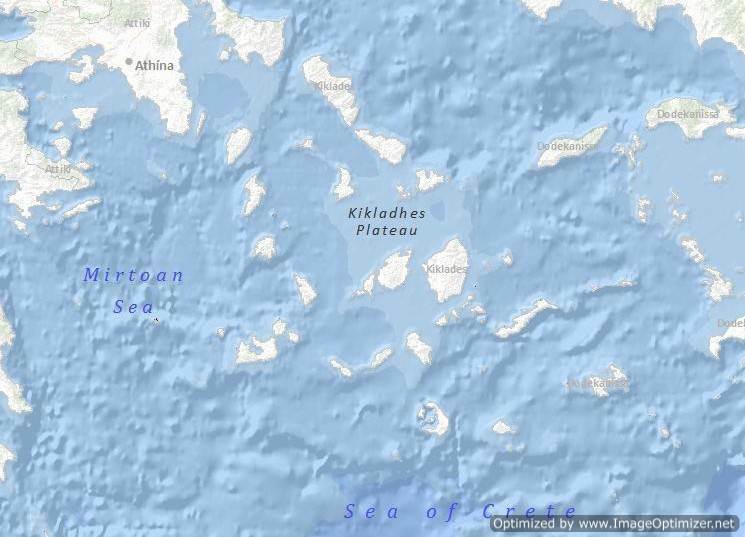 South of Kos, the other islands down to Rhodes are separated from depths of more than 500 meters. Like Milos and Santorini, so in some northern islands in Dodecanese, there was a time of intense geological changes and volcanic activity. The crater at the top of the island Nisyros still reminds it to us. South of both plateau of Cyclades and of Ikaria - Samos - Kos triangle, lies the large basin of the southern Aegean. The depth of this basin exceeds 1.000 meters . And in some places it exceeds 3.000 meters. West of Karpathos island, 32 miles from cape Sidero at Crete, the shaft of Karpathos exists with 3.294 meters depth. Little further, in the east, another shaft reaches 3.298 meters. But the greatest depth of the region which is the largest in the Aegean Sea, is located east of Rhodes. At 14 miles east of cape Lardos, the shaft of Rhodes has 4.043 meters depth.